Are financial analysts worth their payment? This is one of the central question of investors in stock markets. Even after the stock boom at the end of the 90ies, many private investors dealing with stocks and often belief in the advices of so called financial gurus. They present clever chosen historian charts with high returns and use this as a promise for the expected future returns. Negative risks of declining carts were often neglected. A controversial debate began some years ago, if the theory of efficient market is still truth, because new time series models (ARCH-/GARCH models) can shown certain dependencies and time pattern in historian stocks. Consequently, a book “A non random walk down Wall Street” was published by (Lo and MacKinlay, 2000). This short introduction shows the general framework, the ideas and the challenges of the efficient market theory. Aim of the presented paper is a critical introduction based on a verbal and mathematical description on the theory of efficient markets. Introduced method and models were applied to empiric stock data. The concept of the Efficient Market Hypothesis (EMH) states that prices of financial assets reflect all relevant information. Therefore prices in average are accurately, that means financial markets are efficient. A direct consequence is that an active investor cannot continuously beat the market and a passive investor can achieve the same profit in average as the active does. Overall, market values are always true and future prices are randomly depending on randomly incoming news (information). The EMH theory was developed by Eugen Fama in the early 1960. He and other authors corroborated a largely ignored thesis from a French mathematician, Louice Bachelier. Moreover, Eugen Fama extended and refined the theory with a definition of three forms of market efficiency (Fama, 1970) - the weak form, the semi-strong form and the strong form. - independent time series implies that future stock prices are randomly. - the validation test could carried out on the base of event studies, where the effects of news to the share price have to be evaluated. At the end the strong-form efficiency states that even profits are impossible that based on private information, which are not available for all market participants, because this insider information leak out and will taken into the share price. This extreme hypothesis is not supported very well by scientists and therefore it won’t be carried out here. Moreover insider trading is strongly forbidden. The definition of the three different forms of information by Fama is commonly used, but there are also other definitions of information. (Neumann and Klein, 1982) distinguished between central and decentral published information. While central information are costless, decentral information cost and could result from share holder meeting or by business reports. In a similar way divided (Hayek, 1945) information into scientific knowledge, unstructured knowledge and a common used knowledge. 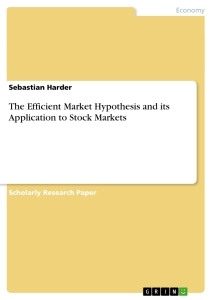 An example (Shleifer, 2000) should summarize the idea of efficient markets. This example based on the economical principal of arbitrage. It means the simultaneous purchase and sale of the same security in two different markets at advantageously different prices. In this sense, stocks could become overpriced relative to its fundamental value, if an irrational investor buys these stocks. The stock price exceeds the risk adjusted net present value of the expected cash flow. Then rational investors or arbitrageurs would sell these stocks, since they know the overpricing and would simultaneously purchase other securities to adjust their profit/risk ratio. This effect brings the stock prices down to its fundamental values, if the arbitrage is quick, substitutes are available and the arbitrageurs competing with each other. These arguments includes that arbitrageurs could not earn abnormal profits. The other way round could an underpriced stock purchased by an arbitrageurs in order to earn a profit. This increased the price in line to its fundamental value. Moreover, (irrational) arbitrageurs that buying overpriced securities and simultaneously sell underpriced securities earn lower returns than passive investors and loose therefore money. At the end, irrational investors become less wealthy and disappear from the market. So, in the long run markets are efficient due to arbitrage and competitive selection (Shleifer, 2000). Based on this argumentation the EMH is subjected to the preconditions of rational trading investors. But, if irrational investors do transact with prices different from fundamental values they would hurt only themselves. According to the concept of the EMH, all relevant information are instantaneously included in the stock prices and expected profits are not predictable. Therefore the best estimation of the share price of the next period would be the actual price. This is the general approach and called “fair game”, which was developed by Fama (see chapter 2.3.2). Models that implicate the “fair game” condition are relevant for testing the EMH like the Martingale Model or the Capital Asset Pricing Model (see chapter 2.3.5). Deviations from these equilibrium models related to empiric data are indicators for inefficient markets or for an inadequate model. Therefore the evaluation of the EMH is always connected to the underlying reference or benchmark - model. The problem consists of a lack of an universal usable reference model. This argument is called “joint hypothesis problem” (Sapusek, 1998) and prevents the unlimited verification of the EMH. Therefore autocorrelated- or abnormal profits in the time series signals not automatically an inefficient market, because the reference model themselves could be wrong. ”As a result, when we find anomalous evidence on the behavior of stock returns, the way it should be split between market efficiency or a bad model of market equilibrium is ambiguous” (Fama, 1991). Tests of the EMH with the acid of a reference model are indirect tests. In opposite to the indirect tests are the direct tests, that use time series looking for repeated pattern by autocorrelation analysis. The general procedure for testing the weak form is to calculate the autocorrelation of returns for certain time lags. If the time series of returns contains linear dependencies, the autocorrelation would yield approximately one. On this base, a linear model to simulate the time series could be estimated. Following (Sapusek, 1998) possible models are the Random Walk model, the Martingale-model or the static CAPM. These models simulate the market equilibrium in terms of the expected returns (compare chapter 2.3). The origin definition by Fama would accept the EMH, if returns are uncorrelated. Otherwise correlations don’t indicate automatically that the EMH have to reject, because dynamic Asset Prizing models used as a benchmark would not contradict the theory of EMH (Sapusek, 1998). Another method is the spectral analysis from the time series of returns. This technique transforms the time depending data into frequency depending data, which were displayed in conjunction with the return amplitudes. Similar to the autocorrelation method, repeated pattern in the data show an inefficient market. Some authors use the filter technique in order to evaluate the EMH. This trading strategy implicate that a stock movement in one direction hold on in the long run and therefore a price dependency is existent. A positive result would contradict the EMH. The first, who applied this technique was (Alexander, 1961). He described the filter variable as follows: ”If the stock has moved up x per cent it is likely to move up more than x per cent further before it moves down x percent”. The name “filter” results from the attribute of ignoring (filtering) small stock movements. The evaluation of the EMH will be carried out by comparing the portfolio development of a filtered stock technique with whose of a simple buy and hold strategy. Buy and hold strategy means to buy an stock and hold the same stock over the time. The profit results by the stock performance and dividend payments during the investment period. In opposite to the buy and hold strategy changes the stocks during the investment period according to the “filter mechanism”. If the returns of the buy and hold strategy are significant higher than returns obtained by the filter technique the EMH is validated. If the stocks selected by the filter technique are significant better than the stocks of the buy and hold strategy, then the market is inefficient. Comparing to the autocorrelation and spectral analysis offered this approach the advantage of bypassing the “joint hypothesis problem”, because this method is independent from an specific model. According to (Sapusek, 1998) the filter technique method is the only way to validate the EMH. The validation of the EMH by the cointegration method is described by (Sapusek, 1998). Most tests for the semi-strong form based on abnormal returns, which are calculated as the profit difference between a certain stock and a benchmark or index stock (market adjusted method). Another method to determine abnormal returns is to calculate the residuum of the used market model (risk adjusted method). An efficient market reacts in terms of abnormal profits not until the relevant news are published. If the stocks significant react before the news appears, the market would be inefficient. Abnormal returns can be assumed, if the variance from the return time series shows unsteady movements. In the theory of the semi-strong form, these movements would go down slowly after the published announcement. An unsteady variance results from investors behavior, because they are uncertain in terms of the “right” investment. This form can be tested by evaluation of insider trading. Insider suspected trades will be identified by abnormal returns before publishing relevant news. The calculation of abnormal returns is similar to that of the semi-strong form. Finally, the empiric evaluation of the strong-form is practically impossible, because it’s impossible to identify persons with certain insider knowledge - except for systematic studies about insider trading. Modern finance is unthinkable without statistic theories and methods. For example, the estimation of risks or of a fair price for complex finance products like options is first possible since the development of theories based on stochastic processes. The following overview is related to (Sapusek, 1999). The formal description of the EMH depends on the assumption that profits can be displayed as random variables. A random variable is a function X that related a real number x according to the result of a random experiment. The outcome of this individual random experiment x isn’t affected by any previous outcome and cannot be predicted with certainty. The outcome x can be adopted to different values x1, x2,…, xn. The frequency of occurrence will be described by the probability density function f(x). The stock prices can be understood as one certain realization dependent from the time variable t (1, 2,…,t). This sequence of a random variable Xt is called a stochastic process. A process is called weak stationary, if the first and second moment is constant in time (strong stationary if all moments are constant). Figure 1 shows a wiener process as a typical example for a stochastic process. Finally, it should be mentioned that the observed stock prices are only one possible realization of a stochastic process. Therefore it’s not possible to calculate the expectation µt or the variance σ²t of the process, because the probability density function is unknown in order to calculate these and higher moments. For that reason mathematical models have to develop in order to describe the EMH. Equation (2.3) means that in an efficient market profits and losses are in average zero. Fama called this assumption a “fair game”, which also includes high, but randomly appearing profits. This assumption is the general approach in order to describe the expected equilibrium rates. The expected stock prices or returns of the “fair game” condition cannot be observed from the market, because the market reflects only one possible realization of the whole stochastic process (see Figure 1). Therefore an equilibrium model has to simulate the expected rates. The resulting residuum (difference between mean and random variable) series will be evaluated in terms of dependencies. If dependencies exist, there are two possible explanations: First the market is inefficient or second the chosen equilibrium model is wrong. This shows the dilemma of the verification problem of the EMH (joint hypothesis problem). The “fair game” condition says nothing about the stochastic process respectively the probability density function, which generate the process and make the expectation values calculable. Fama himself supposed the Random Walk model and the Martingale model in order to calculate the expected equilibrium rates. But also the CAP model (Sharpe, 1964) is often used for this purpose. This definition says nothing about the distribution of the higher moments, like the variances, the kurtosis or the skewness. The Last Three Stock Market Crashes. Can Boom and Bust Be Predicted? Review of "Religious Beliefs, Gambling Attitudes and Financial Market Outcomes"
Do Macroeconomic Variables have an Effect on the US Stock Market?